Happy Sunday! I hope you all had a great and magical weekend 🙂 I had to work Saturday, but John and I went on a perfect date night dinner afterwards. It was so nice, because it had been a while since the last time just him and I went out to dinner. I feel like that alone time together is so important. We then spent a couple of hours Sunday at a local winery! It was nice to get out, enjoy the encroaching fall weather, and sit back to enjoy some beautiful vineyard views. I am so in love with this sweater. I think it is going to be a perfect fall essential for me and I can’t wait to layer it with EVERYTHING. I’m envisioning this piece with chambray, flannel, under vests, under winter coats…the list goes on. 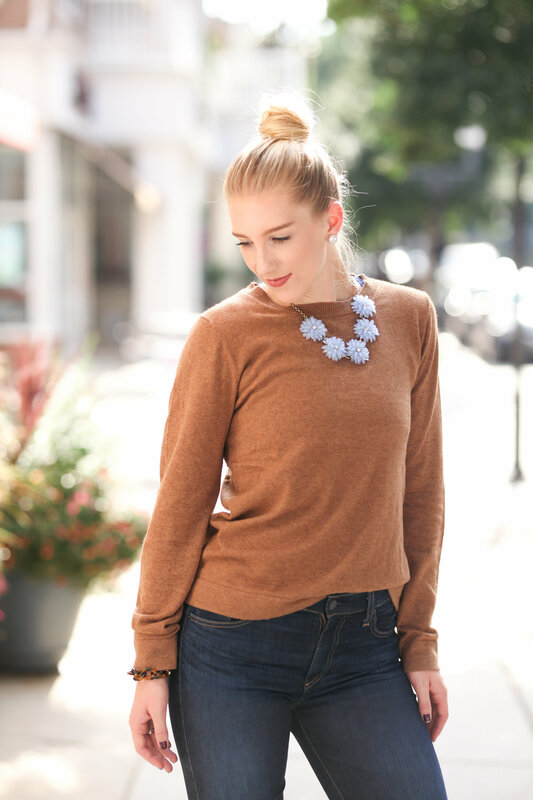 It is basically just an easy sweater to have and I think it will fit in perfectly with the rest of my fall wardrobe. I also am totally in love with the color! There is something so classy about a good camel brown – picture Kate Middleton or Jackie Kennedy. Plus, it is super comfortable, flattering for every body type, and hits at an awesome price point.